16.00h (4.00pm) to 20.00h (8.00pm). Reception is closed after 8 pm. Late-check-in possible if your time of arrival is outside of our check in time. There is a late-check-in fee of € 5,00. You can leave the baggage before your check in or after check out (in concideration of the opening hours). A Payment with Visa and MasterCard is possible (not American Express Card). Choose your own kind of accommodation (room or bed in dormitory) with extra allowance in kind – like breakfast, bed linen, towels and so on. So you have directly influence on the price for accomodation that you have to pay. Our house is located in the old part of Bonn somewhat hidden in a quiet dead end street, but nevertheless right in the multicultural center of the town. Here you will find quite a number of pubs, bars and restaurants as well as any kind of shops. And if you have to go farther away, no problem: subway and tram stations are just around the corner. To Cologne for example you will get by rail within about 30 minutes. Until 2007 the building contained a music school. 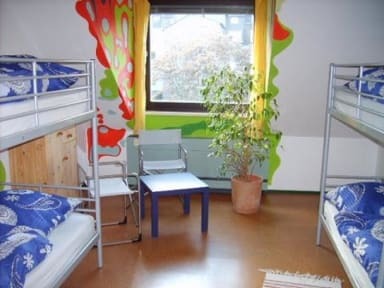 After extensive refurbishments it now offers 12 individually arranged rooms from single/double room to a 8 bed dorm. The big kitchen contains everything you need, whether you want to have just a pot of noodles or cook a whole dinner for the family :-). Our guests will then receive the code for the front door for 24 hour access. After 9pm the reception is closed. Late check in possible (extra charge), please ask before booking. Good place. The only problem is that you have to pay to have access to WiFi. But apart from it, there are no other issues.